[PDF] 100 Things You Need to Know about Microsoft Windows Vista | Free eBooks Download - EBOOKEE! Description: Tired of clawing your way through computer books that start at the beginning of recorded history just to find one tiny nugget of information you need? Tired of wrenching your back to pull that massive Windows tome off your bookshelf? Tired of wishing you could find a simple answer to what should be a simple problem? If you answered yes to any of these questions, then 100 Things You Need to Know about MicrosoftÂ® Windows Vistaâ„¢ is just the book youâ€™ve been looking for. Chock full of timesaving tips, heady solutions, and expert know-how, this book doesnâ€™t break the bank nor does it require a Bowflex body to hoist it around. 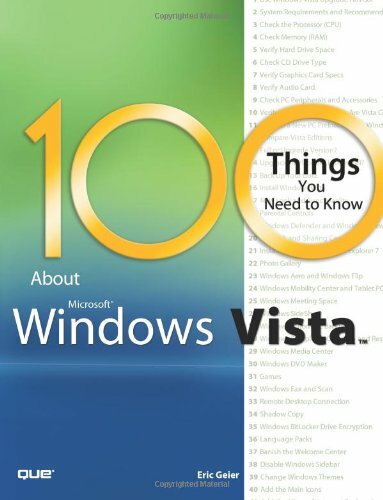 Inside youâ€™ll find step-by-step help for the 100 things every Windows user needs to know when making the big switch between Windows XP and Vista. Even if youâ€™re brand new to Windows (meaning Vista is your first-ever operating system), youâ€™ll find the advice here indispensable. In this book, we assume, for instance, that you really donâ€™t give a hoot about what TCP/IP is. Weâ€™re betting you just want to get your Internet connection up and running, and leave the techy muck to the propeller heads. No comments for "[PDF] 100 Things You Need to Know about Microsoft Windows Vista".